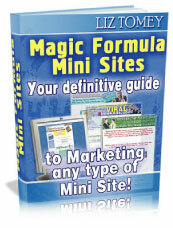 Magic Formula Mini Sites - Get The Insider Secrets To Making Multiple Streams Of Income With PROFITABLE Mini Sites! You'll get several detailed ways to promote your mini site. How many other ebooks out there tell you EXACTLY how to promote your mini site? You'll also learn how to do search engine optimization on your mini site and reap the rewards of tons of free traffic. Learn how you can use nothing but affiliate programs on your mini sites, and earn MORE than a full time income! I'll also share one of the biggest secrets about mini sites, and how you could make $10,000 each month or MORE just like the "big boys" do! Until I realized that there was NO magic formula for building an incredible income online, I was throwing tons of money away trying to BUY the formula. Does that sound familiar to you? I've saved you all the time and money that I wasted, and have put together one of the greatest formulas for making a full time income online. Just a few hours, and you could be in an instant money making business! Let's get right to it? For a limited time I am pricing "Magic Formula Mini Sites" at only $17. Why am I doing this? Because I want YOU to succeed and make money with mini sites just like I have! $17 is affordable to just about anyone, and that's why we've priced Magic Formula Mini Sites so low. Don't be fooled by the price though. This is a 40 page guide that will take you by the hand and show you step by step EXACTLY how to start profiting with mini sites right now!